Problems while performing proDAD Vitascene 2.0 combined with NVidia Quadro 4000 graphic card in Premiere CS. This problem is the result of errors that are hard to determine. We (proDAD) have no influence on these errors. But we would like to pass on tips from other users which might help you resolve the problem. First of all, make sure that you are working with the latest Premiere CS-Update, the most recent Vitascene 2.0 64bit-Service, as well as the newest versions of your graphic driver and Directx. If necessary, the latest versions of these elements should be installed. Then check wether the monitor is correctly connected to the monitor connection ("DVI-D") of your graphic card. Then start Premiere CS and use Vitascene 2.0 as an effect in your clip in the timeline. Do not select the monitor connection "Display Port". In case that the crashes continue in spite of using the right monitor connection, please check if your computer is working in the Dual Monitor mode. Disconnect the second monitor by way of trial and restart Vitascene 2.0 in Premiere CS. At the moment, you are provided with basic information on the technology by proDAD Vitascene. One aspect that is particularly important for correct use is compliance with the requirements in terms of your PC. What is a GPU (graphics processing unit)? Modern graphics cards have an extremely high level of computing power, which is vastly superior to that of the CPUs used in PCs. With Vitascene this power is used to create effects! Digital processing is carried out by the graphics card, speeding up the whole procedure enormously. Brand new technology – 50 times faster than it used to be – with an accelerated GPU! Is your computer suitable for GPU processing? 1. Carry out the test to find out wether your computer is suitable for GPU processing. If the result is positive, the following dialog will open. 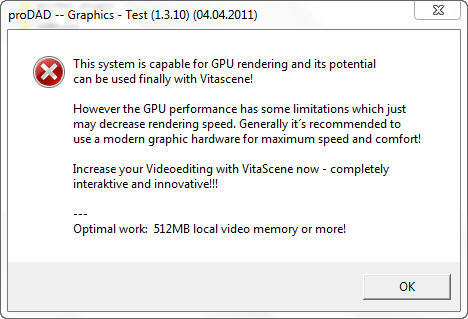 Your graphics card allows real time depiction of the Vitascene effects without any limitation. 3. 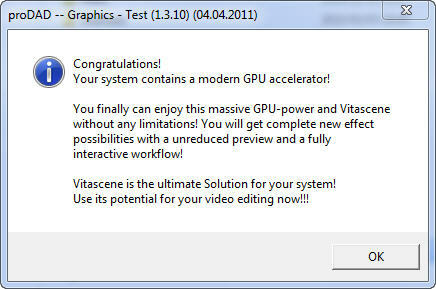 There is also the posibilitythat your graphics card does not dispose of the GPU-related requirements for using Vitascene. In this case, the installation of Vitascene 2.0 will not be completed. Differences between the use of SD material and HD material. HD requires more processing power.